We now have a date and extras list for the home video release of The Walking Dead Season 5. If the patterns of the past hold true, this season probably won’t appear on Netflix until Season 6 has begun, so you’re looking at your only legal way to catch up until then. If you’re suspecting another Limited Edition with a MacFarlane Toys statue is on the way, you’d be correct, but that version of this set is still being worked on and has no release date yet. For the full details, see Anchor Bay’s press release below. BEVERLY HILLS, CA (June 29, 2015) – Five years ago, a man awoke from a coma in a hospital. For sheriff’s deputy Rick Grimes (Andrew Lincoln), what should have been a cause of celebration became the flash point for five years of unceasing horror, unrelenting personal sacrifice…and one of the most popular TV shows ever broadcast. On August 25th, Anchor Bay Entertainment gives home entertainment fans their annual Walker fix with THE WALKING DEAD: THE COMPLETE FIFTH SEASON Blu-ray – Digital HD and DVD releases. Each 5-disc set presents all sixteen gripping episodes from the series that has single-handedly redefined the zombie genre. True to the tradition of the previously released seasons, THE WALKING DEAD: THE COMPLETE FIFTH SEASON arrives jam-packed with three hours of insightful and provocative bonus features that give viewers yet another inside glimpse into creating the fallen world of the Walkers and the souls brave – and crazy – enough to attempt survival. SRP is $79.99 for the Blu-ray – Digital HD, $69.98 for the DVD. 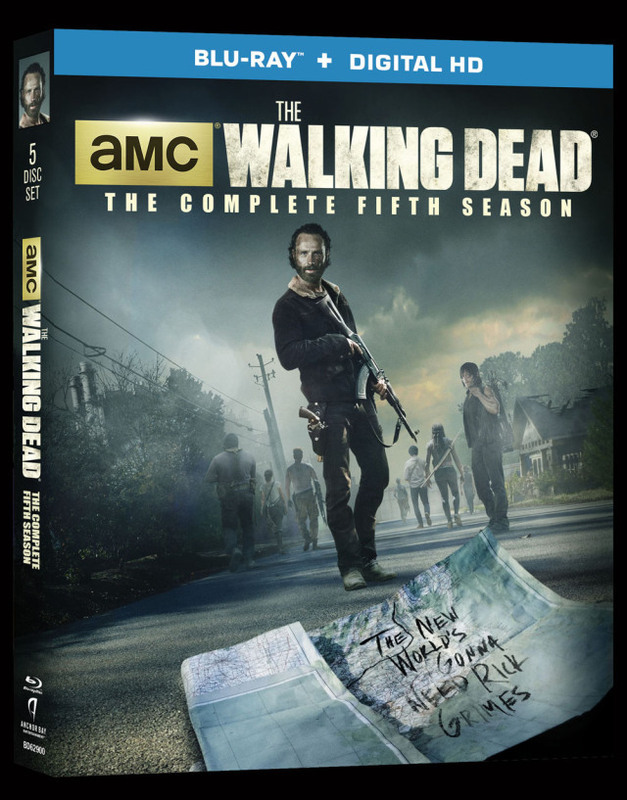 Fans can also look forward to THE WALKING DEAD: THE COMPLETE FIFTH SEASON Limited Edition. Once again, legendary collectibles creator McFarlane Toys has created another must-have unique package for the Blu-ray – Digital HD discs. Artwork and release date will be announced shortly. THE WALKING DEAD: THE COMPLETE FIFTH SEASON cast also includes Norman Reedus, Steven Yeun, Lauren Cohan, Danai Gurira, Chandler Riggs, Melissa McBride, Chad L. Coleman, Sonequa Martin-Green, Lawrence Gilliard, Jr., Michael Cudlitz, Emily Kinney, Alanna Masterson, Christian Serratos, Josh McDermitt and Andrew J. West. The Walking Dead Season 6 premieres on AMC this October.